At Passion Hairdressing & Beauty we don’t just provide a haircutting service. You can also benefit from our range of specialist therapy treatments which include Indian head massage treatment and holistic therapy. Let us take away all the stresses and strains from your daily lifestyle routines and book now for our therapy treatments in any of our salons at Sheffield, Chesterfield and Dronfield. You can benefit from our loyalty card scheme for specialised offers and incentives. Competitive prices for all our services. Specialised massage treatments designed to relieve tension & stresses. Over 10 years of experience within the industry with friendly, knowledgeable staff. 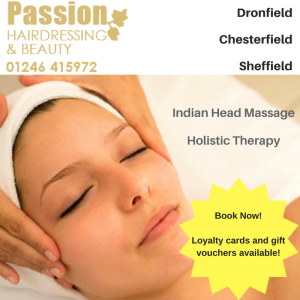 There are many benefits of having an Indian head massage treatment. Quite often, people tend to think of this as a luxury treat, saved perhaps for special occasions or perhaps only done once or twice a year. However, Indian head massages offer a whole host of benefits which can help relieve physical and emotional issues. These may include migraines, headaches and back pain which can cause discomfort from day to day. Other benefits of having an Indian head massage are that it relieves anxiety, depression, sleeplessness, restlessness and insomnia. It can renew your energy levels and boost your memory capabilities. It has also been known to promote hair growth by boosting the nourishment and oxygen supplied to the scalp area. Available in our Sheffield, Chesterfield and Dronfield studios, you can book a holistic therapy treatment which are either a full body massage or back stone massage. We use a blend of aromatherapy oils and hot stones which relieve all your tensions, aches and pains you may be experiencing in your muscles. Holistic therapy targets you as a whole person including your mind, body, soul and emotions, helping you to achieve an improved state of health and wellness. Holistic therapies date back to ancient times and have been known to be used in countries such as Egypt, China and India.The objective of getting this treatment done is to help you restore a sense of balance in your life, allowing you to heal naturally. Why book an Indian Head Massage or Holistic Therapy treatment? Tension or strain in your muscles. Lack of sleep / insomnia. High level of blood pressure. To book a therapy treatment at Passion Hairdressing & Beauty, please give us a call on 01246 415972 or alternatively, contact us online with any queries.